As I have a whole folder of medium and big stitched pieces, I want to stitch something more portable. Like charms or keyfobs. So here is Marie from the Animal Crossing game (3DS). I used 16 count aida. 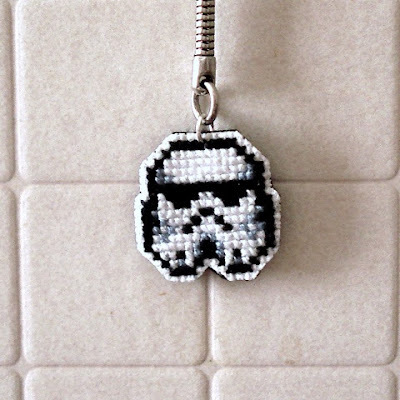 I found the pattern in the numerous Hama beads patterns on Pinterest. Originally I wanted to make a mini cushion, but I'm not really satisfied of the little Totoro I made a year ago, the character gets all out of shape. So I cut the fabric around very close to the stitches like plastic canvas, and put some glue all around so it doesn't fray. Now I need to add a back. 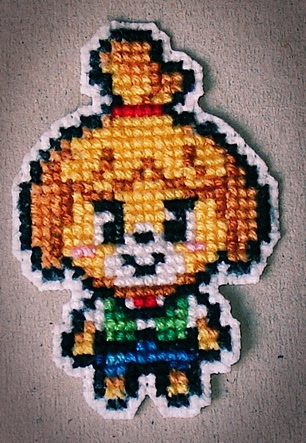 I think I will put some felt, but will I stitch or glue it on? We were waiting at the cashier at the supermarket and I was browsing this cooking magazine for kids, full of good ideas. 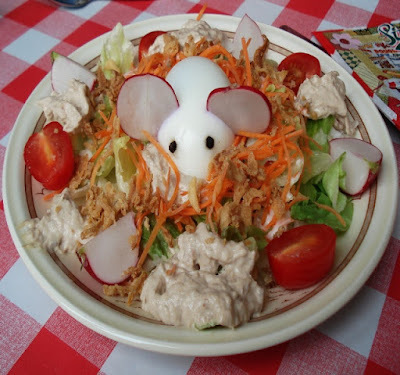 Including the mouse made with an half egg, radishes and pepper. And I put it on top of my usual mixed salad. The guests liked it a lot ! Second freebie stitched this month. But different story. This is an Anchor kit, instead of DMC. And two (ok, three) problems occured. First, just looking at the pattern, I could only brace myself for an arduous backstitching, out of the holes with a pointy needle. It reminded me of the old days when that lady from Anchor got mad at me for warning people of this difficulty in Anchor kits I reviewed. At least I knew what I was getting into. 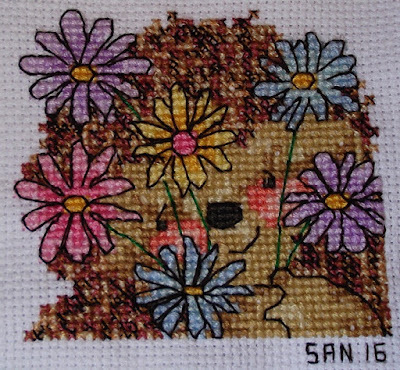 Second, error in the colour chart calling for a brown backstitching on the flowers instead of pink, but never mind. Then this is where we uncounter the real big problem : not enough threads. This NEVER EVER happened with a freebie, from any UK magazine. They usually provide more than enough. Here, at first I was stitching the teddy, and I was having just enough. Just enough is already rare. But it became desperate when I had to make the pink background. I ran out. And I had to use DMC threads to finish the project. And we stitchers know that the colours equivalence is never exact. So what happened ? Was it yet another mistake int he colour chart? Should have it been "stitch in one strand" instead of two? 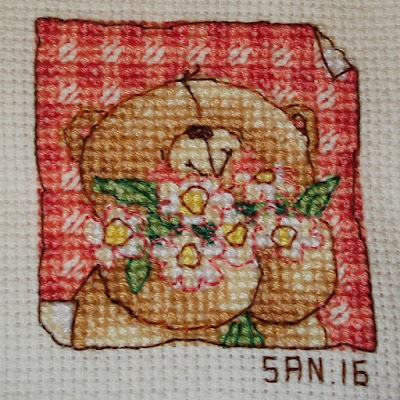 At the moment I feel like stitching in the mornings, but I don't want to tackle big projects. I have a folder full of frame sized finished projects and no place to hang them on the walls without overloading them. And I would rather make cards and mini cushions and such. I have a little collection of freebie coming from UK magazines I haven't stitched yet, so I decided to make those. Starting with this little Edwina Hedgehog with flowers. Not too complicated, except for the number of colours, and the tweaking (stitching with two strands of different colours together). This is a long overue post, but blogging isn't on my top priority list at the moment.... But here are the cookies I made for everybody, family and friends (and DBF's collegues) at Easter. 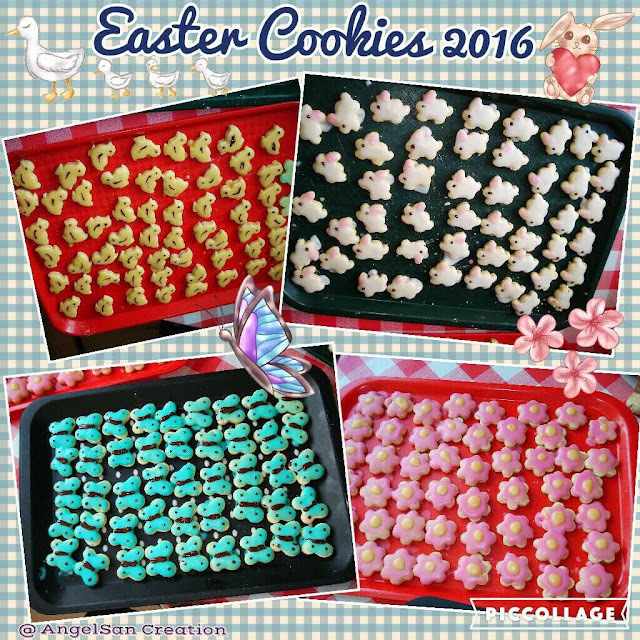 Usually people make cookies for Christmas, but a few years back when I first wanted to try and make cookies, it hapened to be Easter time. So I got a set of cookie cutters with a Spring/Easter theme from my local Hobbycraft. It was lucky because these are hard to come by. At least harder than Christmas ones. The novelty is that I used chocolate for the eyes and decorations over the coloured icing. They should have the same taste, as I made only one batch of batter, but people said they prefered the chicks because they have an almond taste ! Suggestion of the colours ?